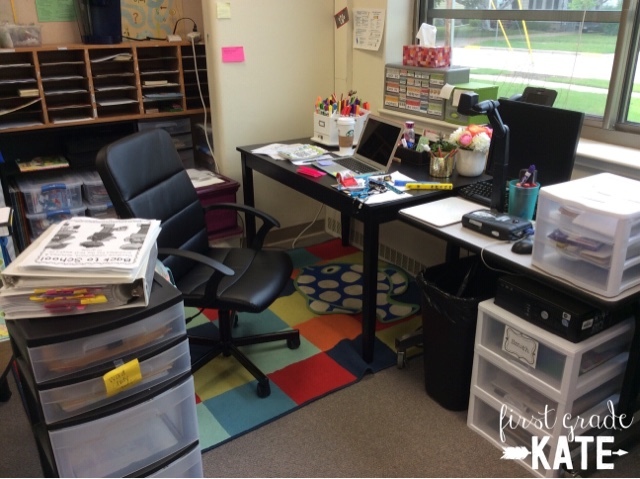 Ok, so I may be the last person on the planet to get my classroom tour blog post up, but hopefully there are still some good ideas and inspiration to be had. The tubs are my monthly book tubs for kids to peruse if they're done with their snack early or if we have a random 5-10 minutes in our day. 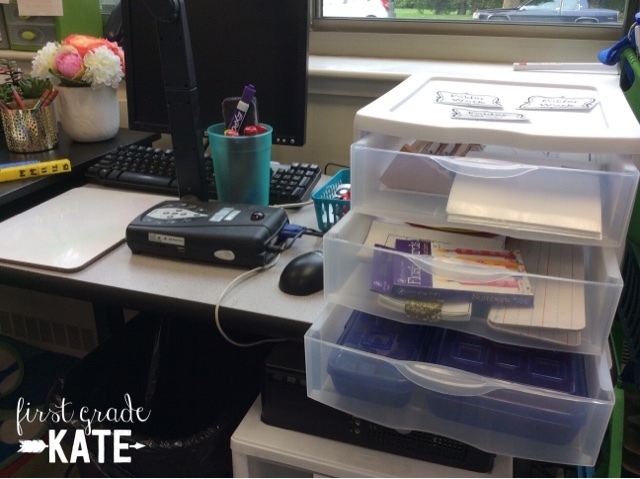 I use the mailboxes to prep my stuff for the week, and the roller bin is where I am now keeping all of the junk that used to be in my desk. In my defense, I did get rid of a lot of stuff from it, but there are just some things (like tampons and good chocolate) that a girl's gotta have a private spot for amiright? Next to my desk is my tech table that holds my doc cam and the desktop computer that I was supposed to get rid of at the end of last year but then never did. 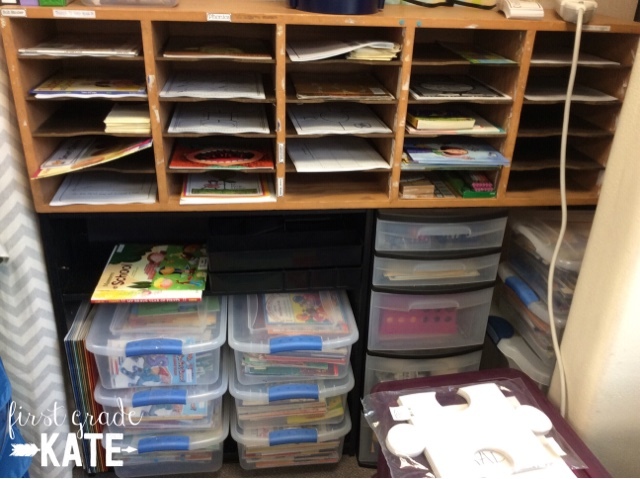 The small drawers are where I keep frequently used math materials like unifix cubes, a rekenrek, a number chart, and subitizing cards. They are great for warm ups or for those times when we have a few extra minutes at the end of class. Next to my tech table are where I keep my clipboards and KleenSlate whiteboards. I shared about that awesome find in an earlier post, but I just gotta tell you, I introduced these to my kiddos a few weeks ago, and they went bananas...like B.A.N.A.N.A.S. bananas. They are definitely going to be an important part of our classroom this year. 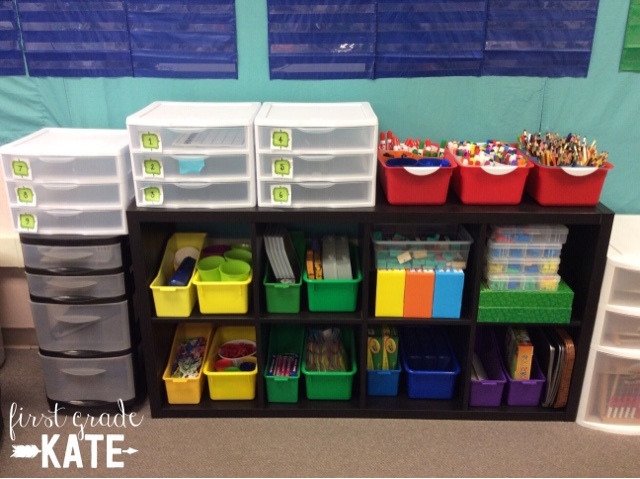 Next to the math tools are my math bin shelves. 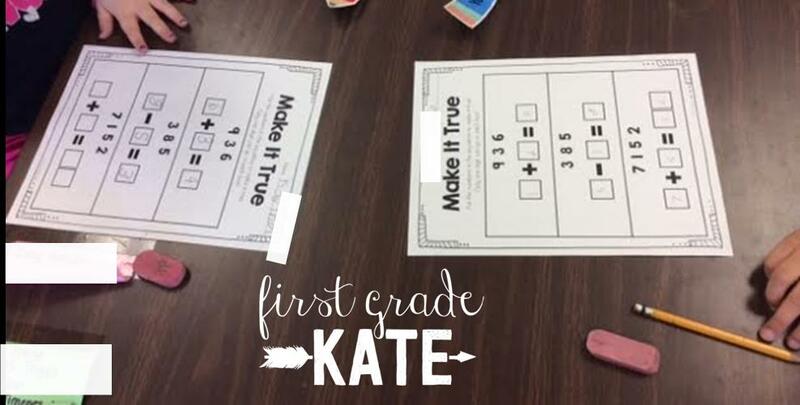 I really need to get on the ball and do an updated post about how I run my math workshop (an older version of my workshop routine can be found here) because I made some changes this past year that I'm really happy with. 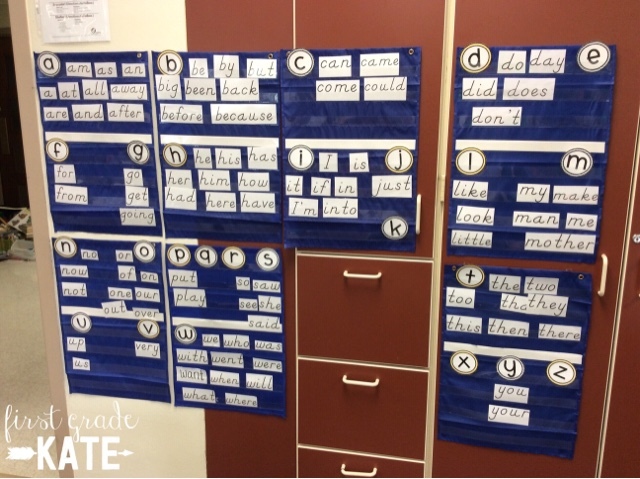 A new area in my classroom this year is my phonics centers area. I am still working out how I want this area to look, but the bookcase from Ikea is definitely an awesome addition! 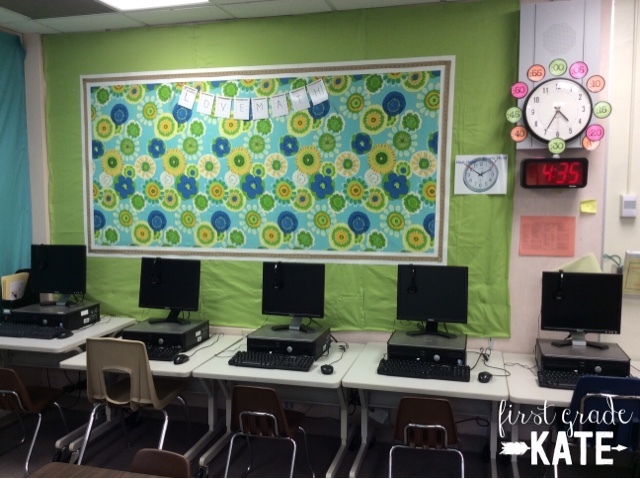 Moving along to my computer area and math bulletin boards. 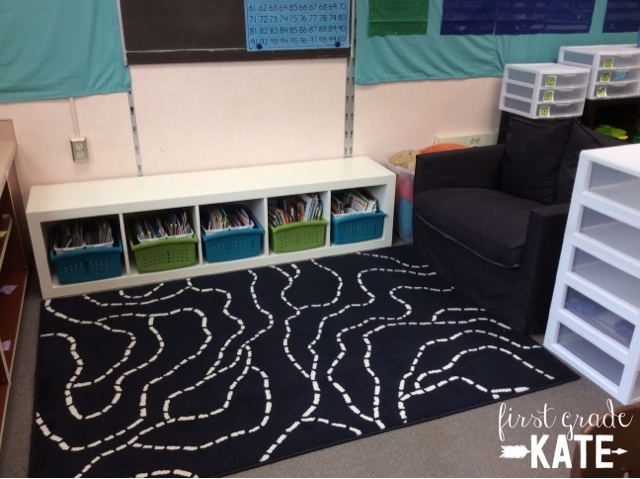 This is where I'm hanging our anchor charts for math workshop. I got the fabric from a craft store a few years ago and love how it looks! 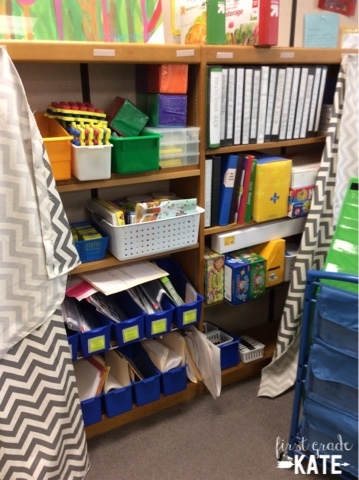 In the back of my room, I have my word wall, iPad storage area (the teal book bins, which were empty at the time, but now hold our iPads), and some storage. 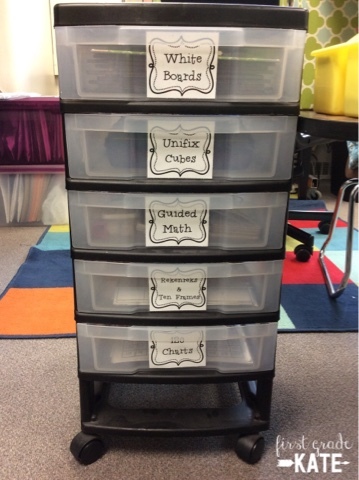 I keep my math centers organized by standard in this tall bookcase. My Ready, Set, Math centers were so helpful last year and are already getting put to good use this year as well! I am excited to introduce more of them next week! I hope you've enjoyed this peek inside my home away from home. 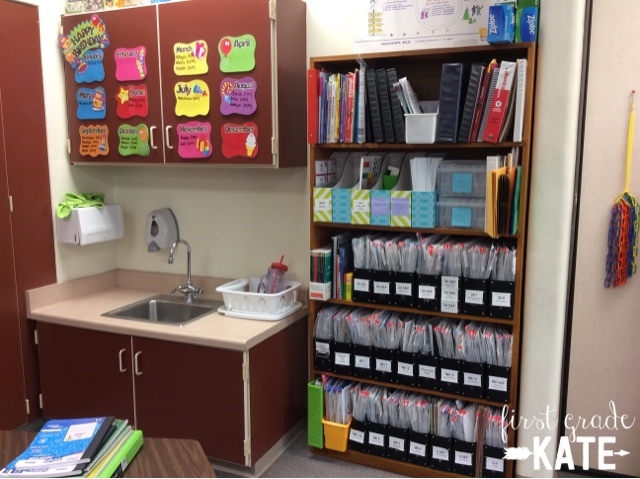 I know I always love to see other teachers' classrooms! Thanks so much for stopping by! So, when my brother was in 4th grade, their class ordered T-shirts. 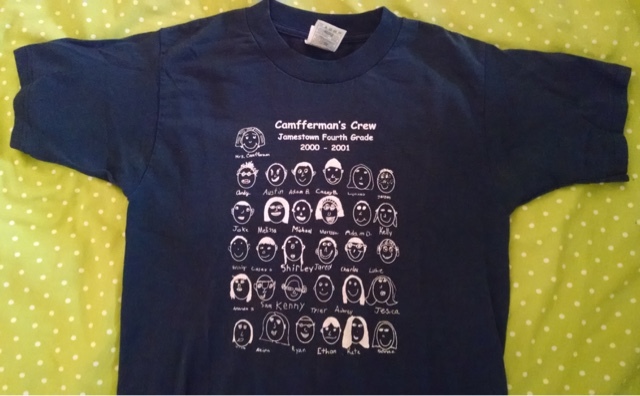 Each kid drew their face, and the teacher submitted everyone's to be put on a class shirt. It was honestly the cutest thing on the planet. So cute, in fact, that I actually claimed my brother's shirt when it no longer fit him. I wore that thing for years, and I got so many compliments on it. I've always thought it would be cool to do something like that with my kiddos, but I didn't know of anyone who did such a thing. 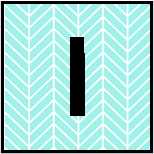 Then, a few months ago, I was checking my Bloglovin' feed and noticed that a few teachers had posted about A+ Images. Lo and behold, A+ Images does class T-shirts, including the ones with the faces on it! 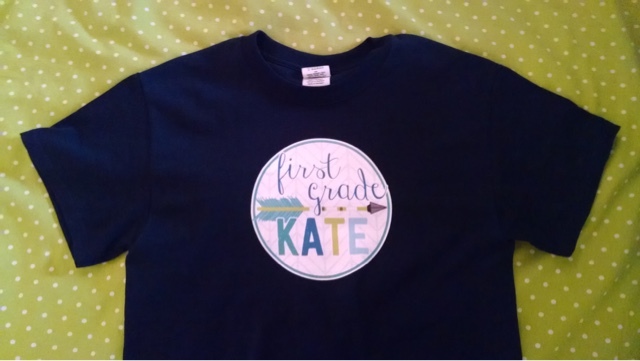 I was so excited that ordering a class set of T-shirts was now a possibility! I was even more excited to find out that A+ Images was offering bloggers a chance to sample the shirts to get an idea of the quality of their products. Many bloggers took them up on this and had the cutest T-shirts with their blog logos for the TPT Vegas Conference. Sadly, I didn't find out about this company until after the conference, but the offer for a free sample goes until September 30th, so I decided to get a jump start on next year's Vegas conference and ordered a shirt for myself. Feeling how nice the shirt was and how well the logo was applied gave me 100% confidence in ordering through A+ Images again. 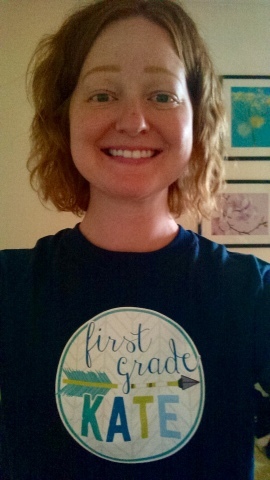 I would love to capture my little firsties' faces on a T-shirt this year! I'm also thinking it would be fun to do a staff T-shirt too. 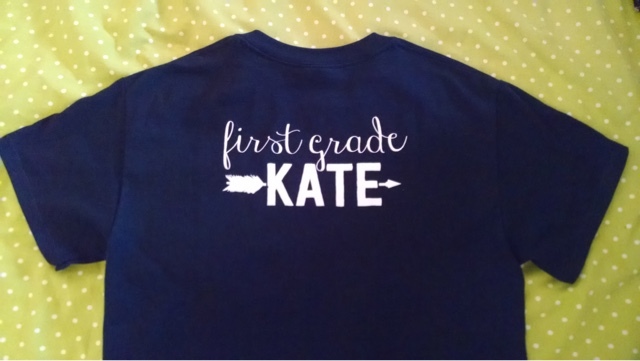 :) If you are looking for a fun way to identify kids on field trips, show class spirit, or even just add some variety to your Friday jeans & T-shirt rotation, you need to check out all of the designs that A+ Images offers! *Full Disclosure: A+ Images provided me with a free T-shirt in exchange for writing this post. All opinions stated are my own. Hi friends! 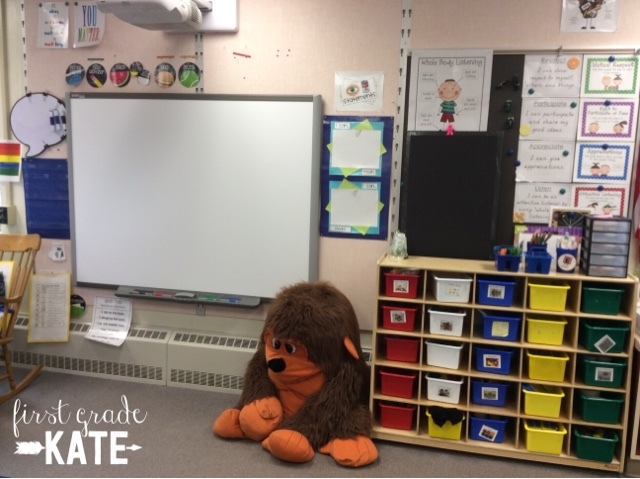 I'm back today to tell you about a new classroom tool of mine that I just LOVE! When I was at the TPT Conference in Vegas this summer, there was an educational expo being held at the hotel. My friend Erica and I were checking out the booths one morning when we came across the coolest product- KleenSlate Whiteboard Paddles! One side of the paddle is a whiteboard, and the other is a dry erase sleeve that comes with a 2 sided template (handwriting lines or graphing paper). 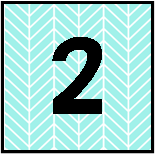 BUT here's the coolest thing...the template comes out and you can insert ANY template or graphic organizer that you need! I was seriously excited when we found this out. I was already picturing how I could use these in my classroom...kids could use math templates with ten frames and number bonds to show their thinking, write down their answers to our Question of the Day, plan out the details of their writing, use a T-chart to sort words during phonics, and pretty much any other type of formative assessment I might need to do. While I was busy oohing and aahing over the versatility of the dry erase sleeve, Erica was most impressed with the markers. Because the ink tube goes all the way to the end of the marker, it is impossible for kids to push the points in. YES, you heard that right! No more throwing out markers because kids pushed too hard. How great is that?! Another awesome feature? Everything is attached, so you don't waste precious instructional time passing out materials! The marker attaches to the handle, and there's a cleaning cloth that clips to the board with a ring. I was so impressed with these boards after I saw them at the expo that I just HAD to splurge on a class set. 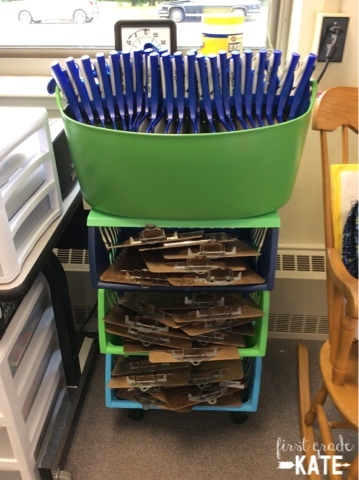 I chose to get all blue to match my classroom (and to eliminate issues of arguing about color), but they have a variety of colors to choose from. Is your teacher heart geeking out now as much as mine was?! 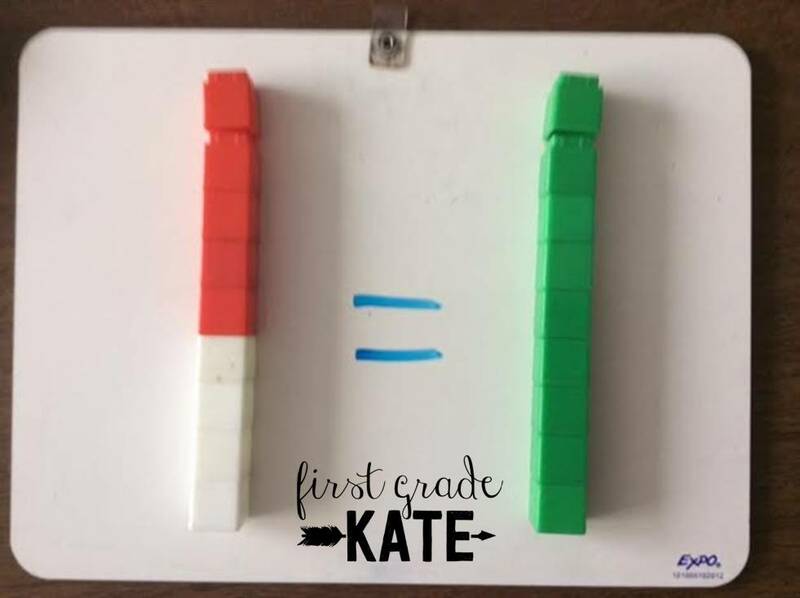 Well...here is the absolute BEST part....KleenSlate is letting me give away a set of 12 whiteboard paddles to one lucky teacher! How awesome is that?! Just enter the Rafflecopter below for your chance to win! *Full Disclosure: KleenSlate provided me with a few extra boards & markers in exchange for writing this post and hosting the giveaway. All opinions stated are my own. 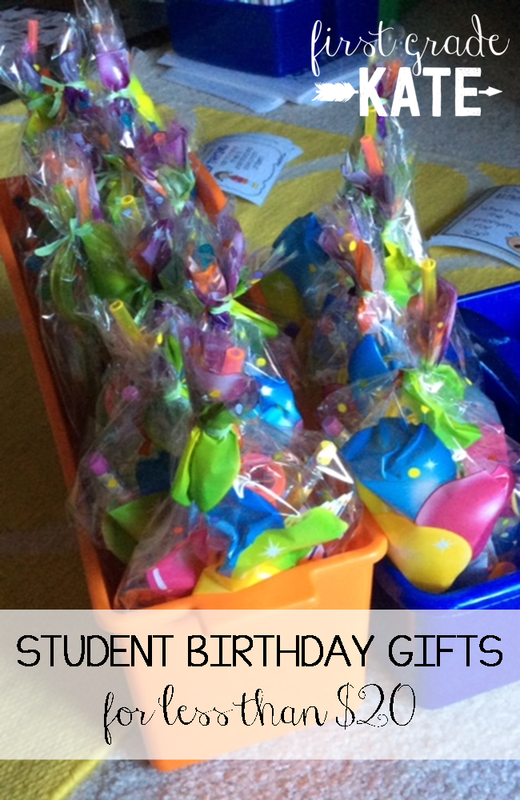 Birthday Bags - 20 gifts for $20! Hi friends! 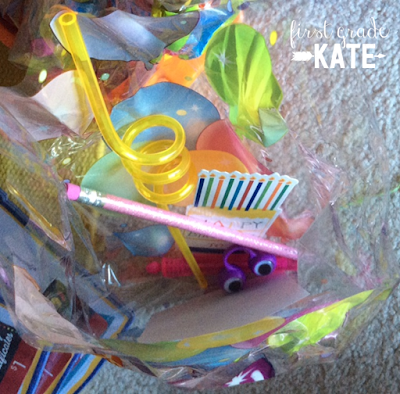 As I am prepping things for the new year, I wanted to stop in & share a few tips about birthday bags. 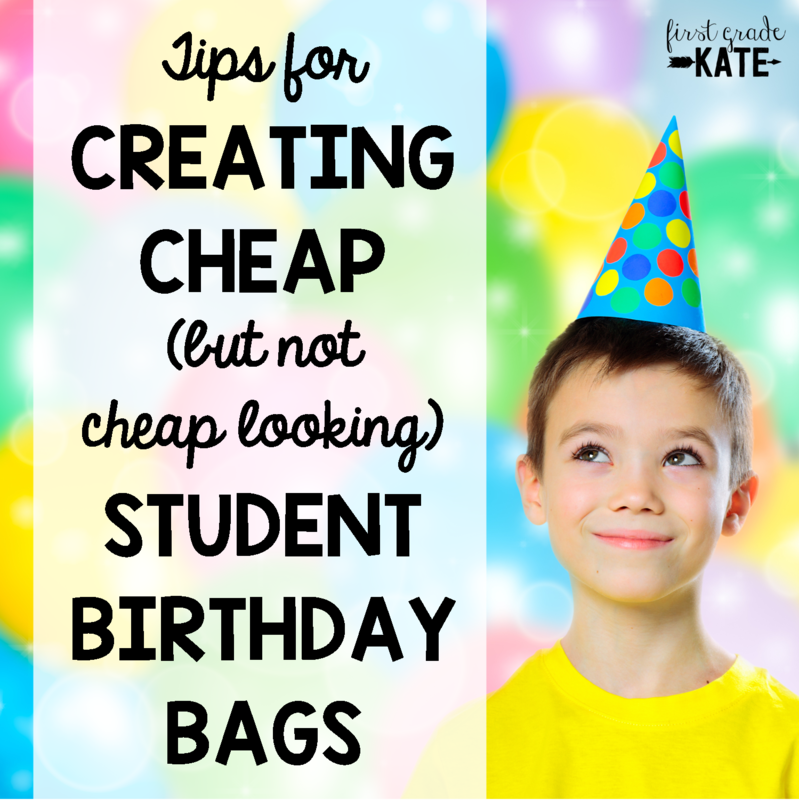 If you're like me, you want to give your kiddos something to help them celebrate their special day, but you want it to BE cheap without actually LOOKING cheap. (Now that I think about it, that's kinda my motto with all gifts...) Anyway, here are some tips to putting together cheap (but not cheap looking) student birthday gifts. Tip 1: Look in the party sections at Target, Walmart, Michaels, etc. They often have 6 or 8 packs of small toys for only a few dollars! I've also found fun stuff like bubbles, notepads, googly eye rings, and crazy straws. You do have to be careful, as some of it isn't the best quality, but there are some hidden gems too. 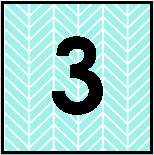 Tip 2: Look in the Target Dollar Spot over the summer. I know this tip probably isn't new (anyone else religiously stalk browse the dollar spot over the summer looking for cool things? ), but it's still worth mentioning. The past few years, I did a Dr. Seuss birthday theme with Dr. Seuss pencils, erasers, & bookmarks...all from the Dollar Spot! So, what to see what mine turned out like? Take a peek! 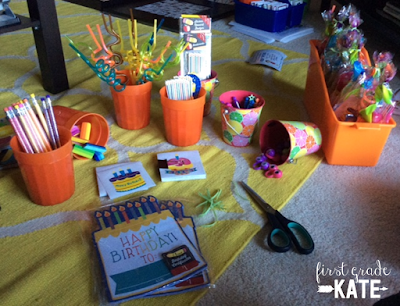 When you assemble your birthday bags, I recommend setting up an "assembly line" with all of the items lined up in front of you. 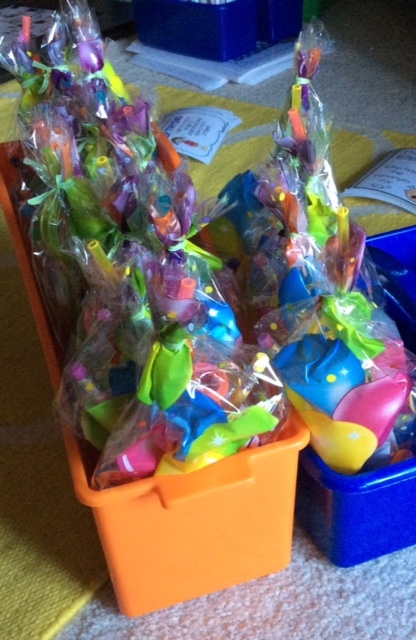 Grab a bag, go down the line and put the items in, tie it off with a twist tie (comes with the bags), and viola! 20 birthday bags...ready to go for my kiddos! 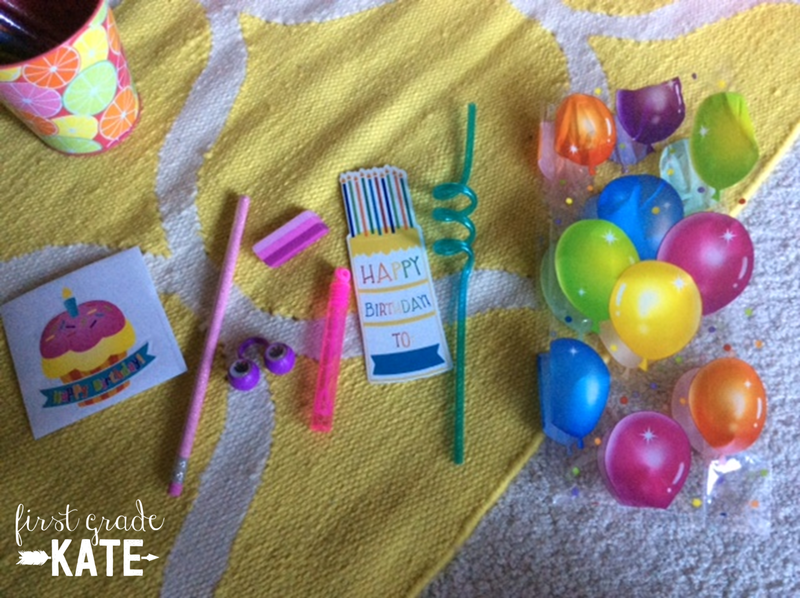 I am linking up with Jen from Teacher by the Beach for Wishlist Wednesday. I plan on linking up with her throughout the summer to giveaway some of my most wishlisted products AND offer them at a 30% discount. 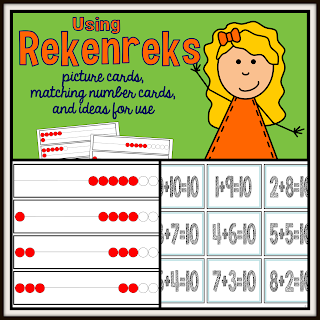 Today's product: my Rekenrek pack! 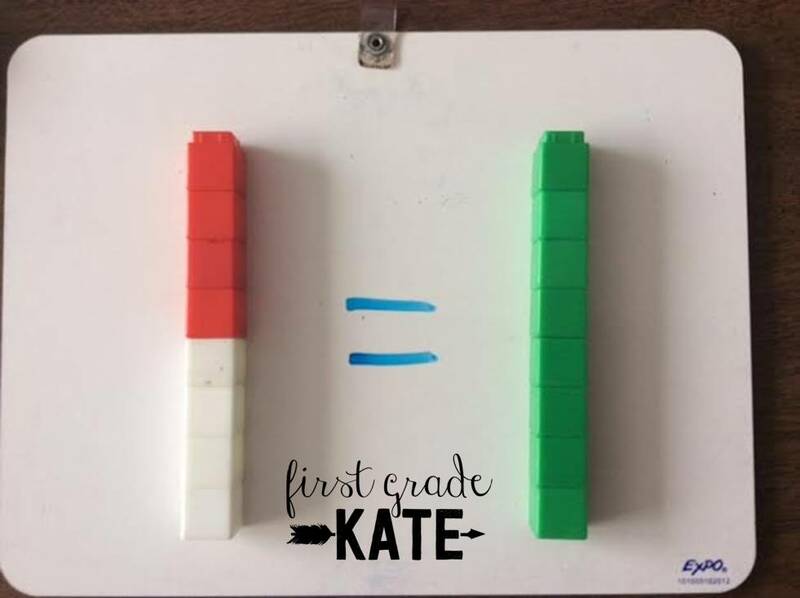 This product is super helpful to me at the beginning of the year, as I spend a lot of time helping kids subitize and compose/decompose numbers in different ways. 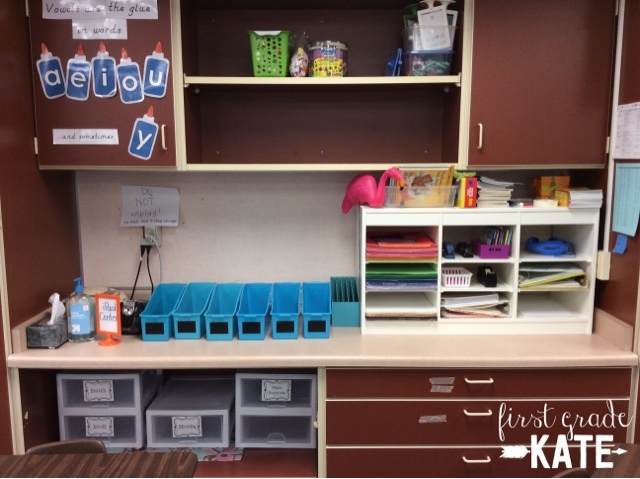 I use it whole group as a warm up, but it would also make a great sorting/matching center. Enter the Rafflecopter below or get it 30% off (only $3.50!) until Friday! (If you purchase and then win the giveaway, you can pick something else of equal value.) Hurry, the sale is until Friday, but the giveaway ends tomorrow night! It's been a few weeks since I've been on here...I've been extremely busy with school and all the extra commitments that come with it! 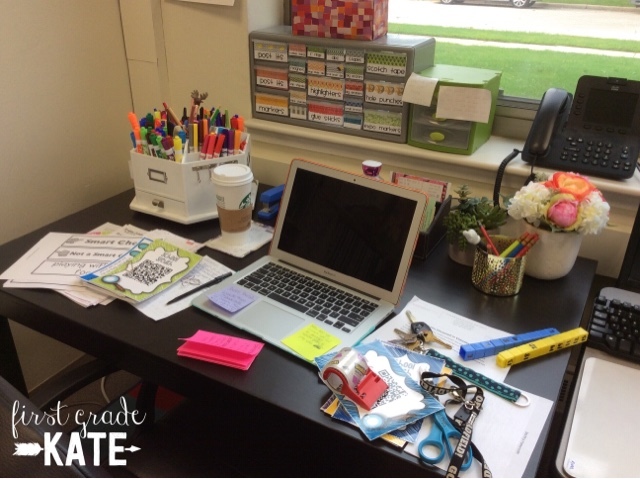 I'm back today to link up with Doodle Bugs Teaching and share a little bit about the past couple weeks. As part of my grad program for elementary mathematics, my cohort is looking at how equity (or lack of it) affects achievement in mathematics. 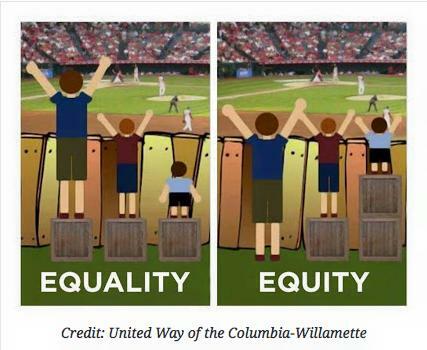 I found this visual on Facebook, and I love how it shows the difference between equality and equity. So often, there is a focus on making things equal, when really, there should be a focus on making things equitable. I am excited to delve more into this topic in the coming months. 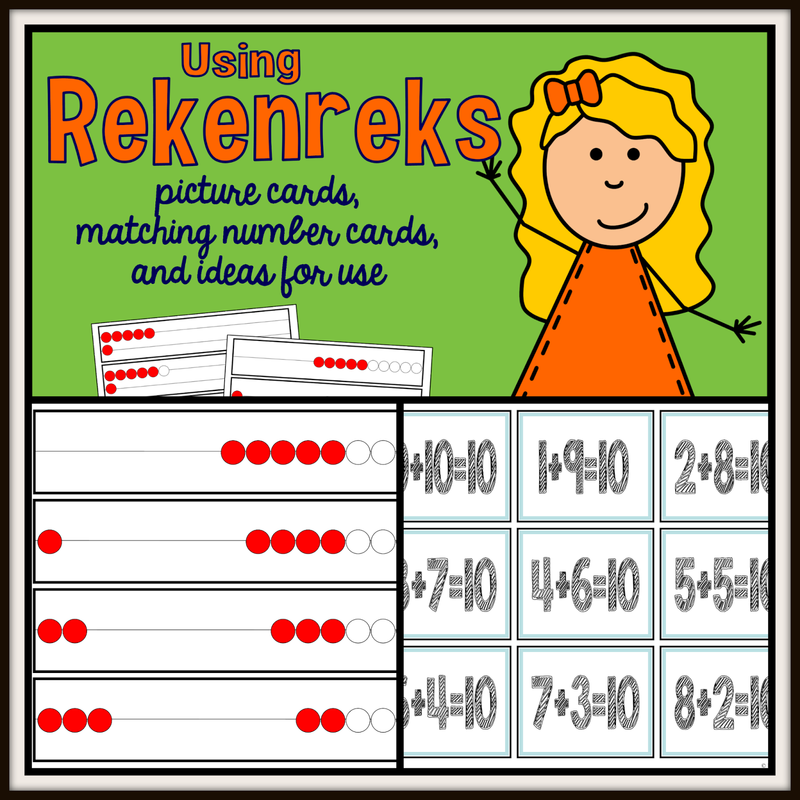 This activity is from Month 4 of my Ready, Set, Math series. It was a great practice activity for algebraic thinking because kids had to fill in the numbers so it would make sense. 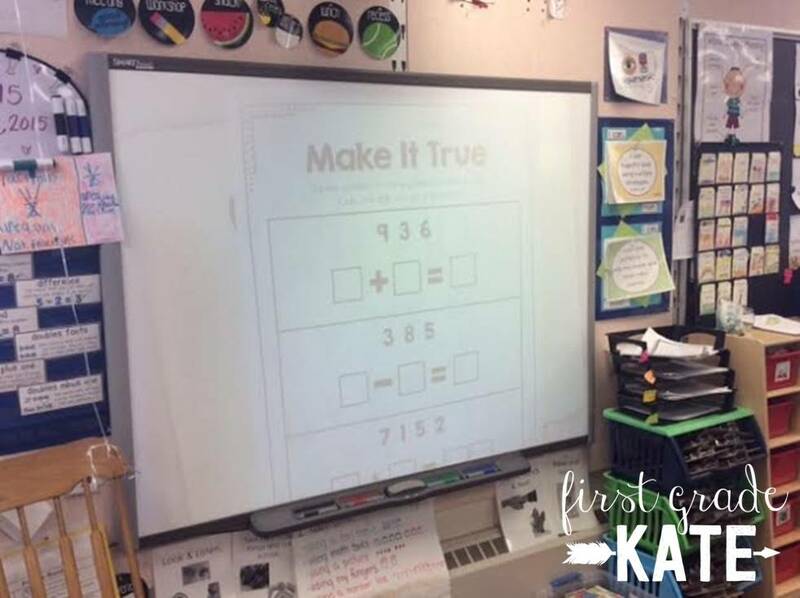 It was also a great review for turnaround facts and fact families because kids made the connection that you could have the addends flipped and it would still be true! :) Even though it's from an earlier pack, I love that I could pull it back out later in the year without it being the wrong season or theme! Start with a doubles fact and show that the towers are equal. 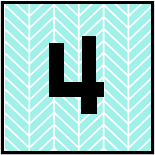 Add a cube to one of the addends to make it a near doubles fact. 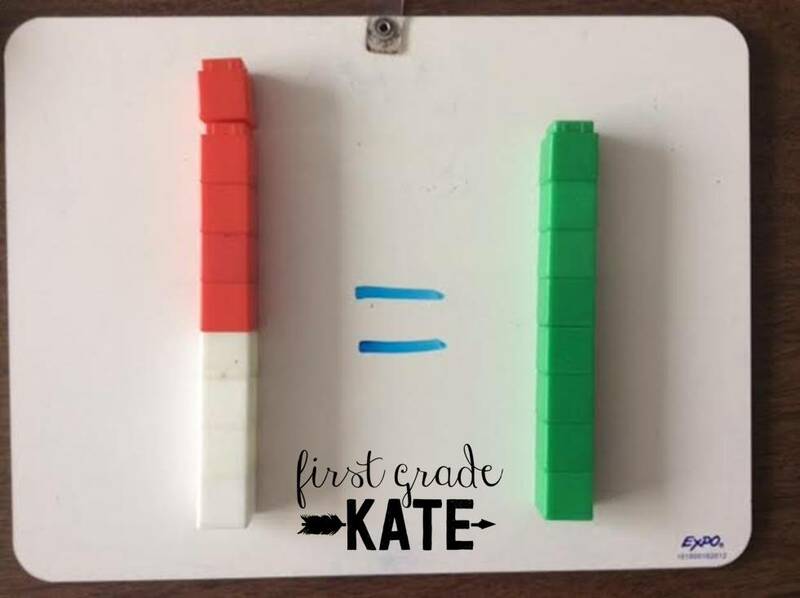 Ask kids how to make the other side become equal. Add a cube to the tower representing the sum. Once that side gets another cube, things are equal once again. Some of my kiddos were struggling with near doubles facts, so I used cubes to visually model how to go from a doubles fact to a near doubles fact. It really helped to see the extra cube getting added and how we needed to add 1 more cube to the total as well. This was actually from a few weeks ago but it never made it to the blog. 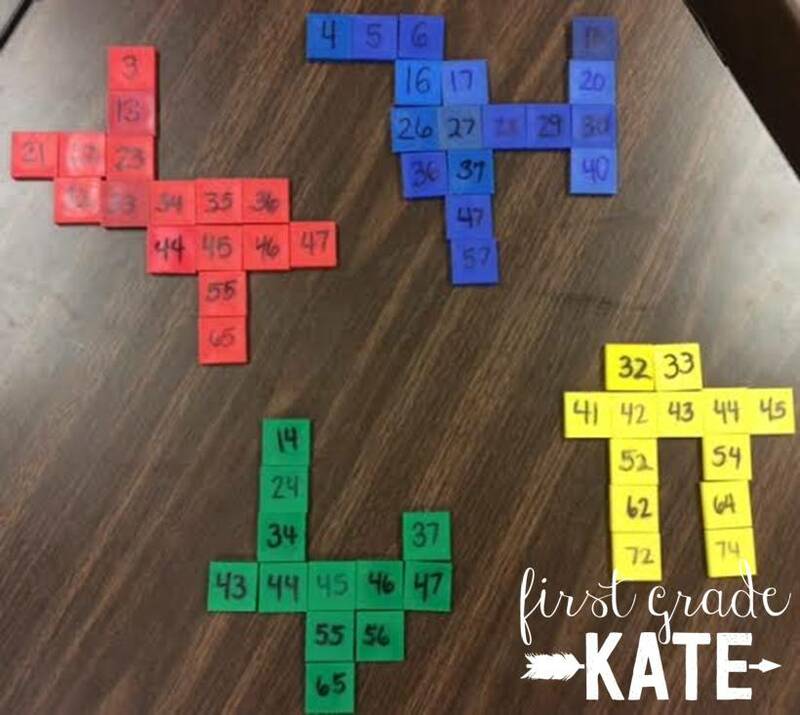 Once my kids were pretty solid with knowing the patterns of the number chart, I made these number tiles that the kids had to put together as puzzles. It will be sooo much easier to make the connection to "10 more, 10 less" later in the year because they've already been doing it with these tiles! Well, that's a wrap folks! 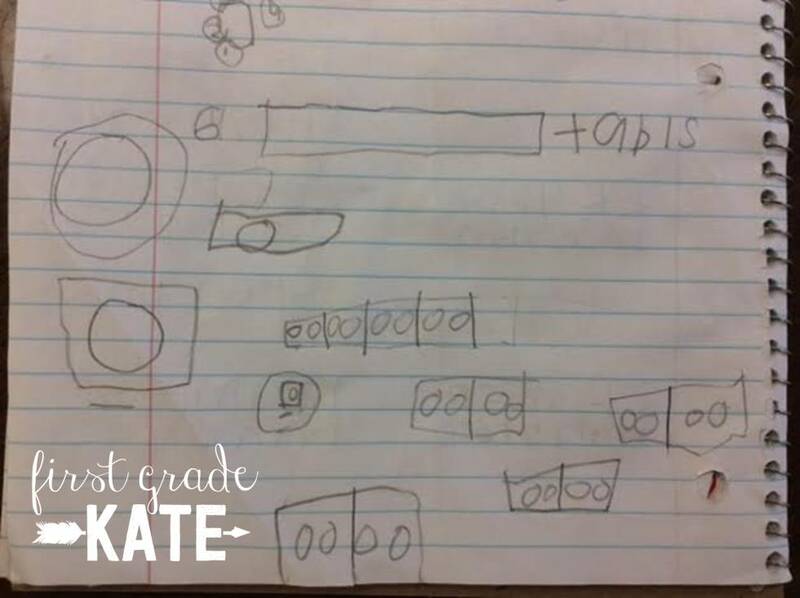 Make sure you head back over to Doodle Bugs Teaching and check out what else people were up to this week!